No matter where you’re driving, in a residential area or on the open road, you run the chance of hitting an animal, on accident of course. Animal accidents are common in this day and age. However, it’s important to know what to do in these situations in order to keep the road clear and safe for other drivers. Read our tips below. First, after hitting an animal, pull off to the side of the road, stop the car and make sure that you and your passengers are okay. Put on your hazards on to warn other drivers of the animal on the road. If the animal is still alive and severely injured, it will most likely be scared and act erratically, and it’s best to call the authorities and have them handle the situation. If it’s a dog or cat, see if the animal has any identification and call their owners. 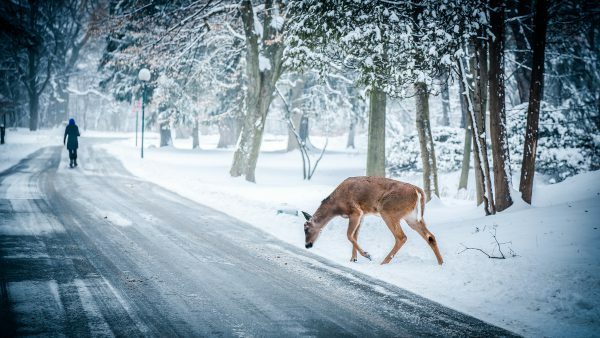 For wild animals, such as bears, boars and even deers, stay in your car and report the accident. These animals can withstand being hit from a car and are considered dangerous. Most importantly, you’ll need to call the police and report the accident. Many states have strict penalties for those drivers that hit an animal and leave the scene. Finally, after calling the police, take pictures of your car and the damages the accident caused. This is important when you report the accident to your car insurance agent. In addition, it’s important for drivers to know how to avoid hitting an animal. First, look for signage of possible animal crossing and slow down if these signs are on the road. Watch for wildlife near the road at dawn and dusk. Chances are, there’s probably more than one animal near the road, such as a mother and her babies. When you’re driving at a lower speed limit, the chance of you hitting an animal or having it total your car are much lower. Plus it gives you better reaction time. Scan the road as you drive and be cautious in roads surrounded by forest, fields or streams, as animal life is more likely. At night, use high beams and lower your dashboard lights slightly to avoid glare. Also, if an animal is on the road and a collision seems unavoidable, brake—don’t swerve. If there is enough distance between your car and the animal, tap on the brakes and honk to see if the animal will run away. If there is not enough reaction time, it’s better to hit the animal than swerve and cause greater damage to your car. Stay in control of your car and slow down as much as possible. After the accident, make sure to call the police and your car insurance company. For more on driving safety tips, as well as fun facts, defensive driving courses, competitions, and other cool stuff, follow DefensiveDriving.com on Facebook and Pinterest.